Specifics/Features — Experience high quality clean shaving with Mach3 sensitive shave gel.. Equipped with patented DLC Comfort Edge to assist in reducing irritation.. Gentle and slow advanced indicator fading blue strip for alert on when to change blades.. Specially designed blades closer enough to your beard resulting in fewer strokes.. 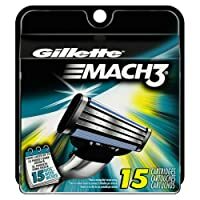 Fit all Mach3 razors..